Here are a handful of books that might help keep children busy (and parents sane) over the summer. We have never hidden the fact that were big fans of both the Mega Mash-Up and Magical Mix-Ups in the Library Mice household (see previous reviews: Magical Mix-Ups: Birthdays & Bridesmaids, Mega Mash-Ups: Aliens vs Mad Scientists Under the Ocean, and the first two Mega Mash-up books) . 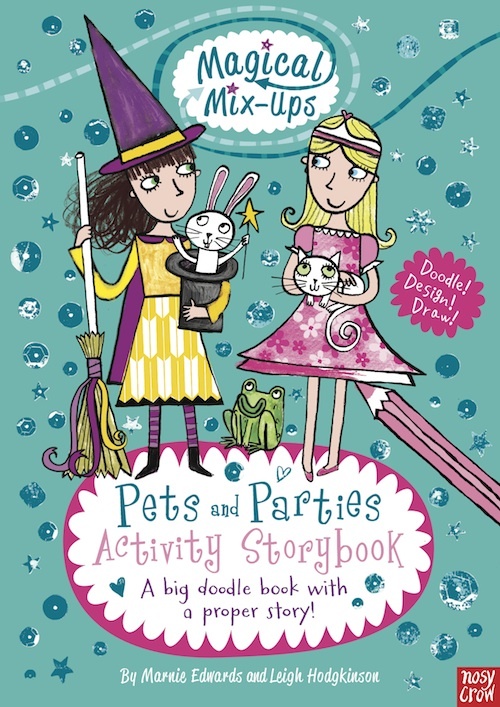 Earlier this year, Nosy Crow published a new Magical Mix-Ups, in a new A4 format, allowing for even more doodling and creativity. In this third volume of Princess Sapphire and Emerald the Witch’s adventures, it is Sapphire’s birthday and she is desperate for a pet but best friend Emerald buy her the next best thing: tickets to an animal magic show. But when the star performer, Dinky the cat, disappears, the girls are keen to help, and little artists are invited to help them with the search and rescue operation. The clever design of the book and Leigh Hodgkinson’s quirky and fun artwork make doodling and drawing impossible to resist. But the text, set in chapters, can also be read on its own, making it enjoyable on several levels. This new format will keep readers entertained for hours! 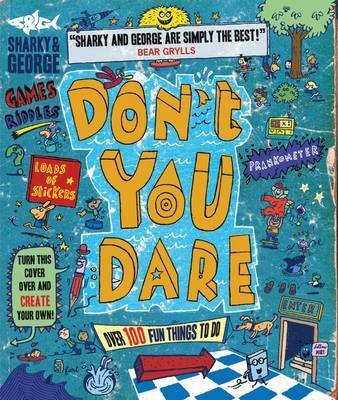 This book promises to be the ultimate book of fun, and it certainly tries very hard at achieving it! With over one fun things to do which go from little and massive games to games at the beach and pranks, there is so much to do in this book. Each activity comes as a fact file: how many people can be involved, and “what” and “why” sections. The book is heavily illustrated and its design is well thought of and pleasing to the eye. What is great about Don’t You Dare is that It encourages good old-fashioned fun with no electronic gizmos needed: flick books, blind-folded obstacle course, modelling clay, rock pool top trumps and many more. It encourages kids to be creative and active, with plenty of stuff to do outdoors but also some indoor stuff for a rainy days. And it even has a secret chapter. And you can even redo the book cover by flipping the dust jacket. 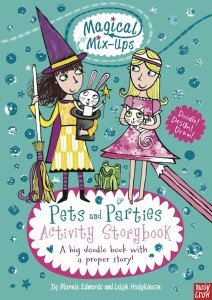 A really clever book with plenty of the kind of fun that children should have during their summer holidays. A kind of Where’s Wally for pre-schoolers, this is a great series which mixes narrative and a game of finding Mimi on each double spread. From the airport to the beach, and the art gallery to the end of holiday karaoke party, little readers follow Mimi and her family as they enjoy their holiday. There is plenty to discover on each double-spread, thanks to the vibrant detailed artwork, and no doubt young audiences will discover something new every time they look at the book. Mimi’s experiences and the settings she visits will mirror many preschoolers’ own experiences in the holiday which will make the book all the more fun. There is even a board book included, and some stickers, so there are hours of fun to be had. 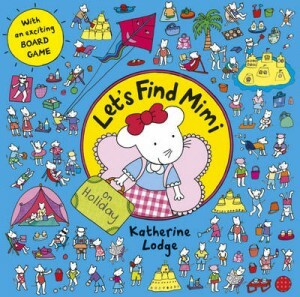 The Let’s Find Mimi series comprises another three books. 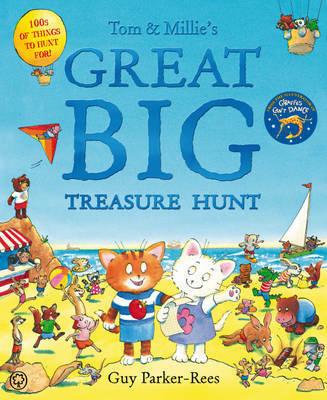 Tom and Millie are on a treasure hunt and have a list of very important things to find. 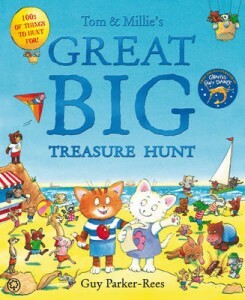 They visit the beach, the park, the indoor play area and many other familiar settings in order to find their treasure, and on each spread, they ask little readers to help them find the next item on their list. Guy Parker-Rees’ incredibly detailed and exuberantly coloured artwork will make this book an instant hit. It is interactive and fun and all the familiar setting it portrays will make it all the more fascinating for pre-schoolers. The market spread is particularly glorious, it oozes summer happiness. As well as offering a fun story with plenty to look at, the book also aims to help little readers with their number, colours and shapes. It also promotes team work and celebrates friendship . Even the endpapers are part of the fun! A second book in the series Tom & Millie’s Busy People has just been released. This new book focusses on the jobs people do and again includes some greatly detailed double-spreads for children to pore over: from supermarkets to building sites, airports to allotments, and even a lovely double page about the library. This second book will also undoubtedly keep little people busy for hours and also offer an opportunity for trip to visit some of the settings included in the book. Don’t forget the Belle and Boo activity books are reviewed here.